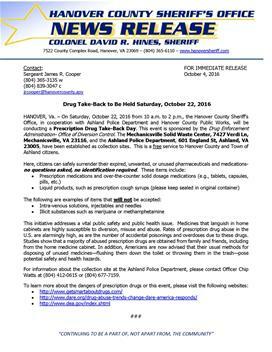 HANOVER, Va. – On Saturday, October 22, 2016 from 10 a.m. to 2 p.m., the Hanover County Sheriff’s Office, in cooperation with Ashland Police Department and Hanover County Public Works, will be conducting a Prescription Drug Take-Back Day. This event is sponsored by the Drug Enforcement Administration- Office of Diversion Control. The Mechanicsville Solid Waste Center, 7427 Verdi Ln, Mechanicsville, VA 23116, and the Ashland Police Department, 601 England St, Ashland, VA 23005, have been established as collection sites. This is a free service to Hanover County and Town of Ashland citizens. This initiative addresses a vital public safety and public health issue. Medicines that languish in home cabinets are highly susceptible to diversion, misuse and abuse. Rates of prescription drug abuse in the U.S. are alarmingly high, as are the number of accidental poisonings and overdoses due to these drugs. Studies show that a majority of abused prescription drugs are obtained from family and friends, including from the home medicine cabinet. In addition, Americans are now advised that their usual methods for disposing of unused medicines—flushing them down the toilet or throwing them in the trash—pose potential safety and health hazards. For information about the collection site at the Ashland Police Department, please contact Officer Chip Watts at (804) 412-0615 or (804) 677-7159.